The Aethiopian Cetus was a monstrous sea creature spoken of in Greek mythology. Associated with the land of Aethiopia, this Cetus would famously be encountered by the Greek hero Perseus. ​The Aethiopian Cetus was the offspring of the primordial sea deities Phorcys and Ceto, and was thus a close sibling to the Trojan Cetus, a sea-monster encountered by Heracles. The Aethiopian Cetus was thus also sibling to the three Graeae, the Gorgons, Echidna and Ladon. The descriptions of what the Aethiopian Cetus look like are scarce, and most commonly come from ceramics, where the Cetus is often depicted as a sea-serpent, although occasionally feet like appendages are also present. In antiquity, the name Cetus was also given to whales, sharks and large fish, although these creatures would have issues ravaging the coastline. ​The Aethiopian Cetus comes to prominence during the adventures of the Greek hero Perseus. Perseus, having decapitated Medusa, was flying home to Seriphos, making use of Hermes’ winged sandals, when he flew over Aethiopia, the land south of the Sahara. There, Perseus saw the beautiful Andromeda chained to rocks jutting out of water, and the Greek hero also observed the approach of the Aethiopian Cetus. ​There is of course a reason as to why Andromeda is chained to rocks, awaiting her fate as a meal for the Aethiopian Cetus. It begins with the hubris of Andromeda’s mother, Queen Cassiopeia, wife of King Cephalus, who boasted that her own beauty, or that of her daughter Andromeda, surpassed that of the Nereids, the nymph daughters of Nereus. The Nereids were part of the retinue of Poseidon, and when they heard the boast of Cassiopeia, they called upon Poseidon to punish the Queen of Aethiopia for comparing herself to goddesses, all be it minor ones. Poseidon then sent a flood to inundate the shoreline, and the Aethiopian Cetus to ravage Aethipoia, killing all the unwary. Cephalus consulted the Oracle of Ammon, who told him he must sacrifice his daughter, and the Aethiopian populace would not let their king do otherwise; and so Andromeda was chained to rocks to await her fate. ​The most common tale of the demise of the Aethiopian Cetus tells of Perseus taking the head of the Gorgon Medusa from his mystical satchel, and then the gaze of Medusa simply turned the sea-monster to stone. 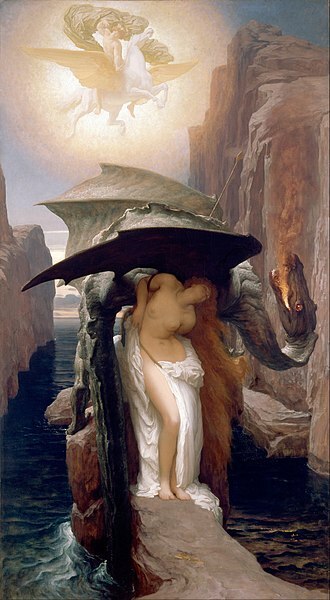 Thus, Aethiopia was saved from the monster, and Andromeda could be freed from her chains. Alternatively, the Aethiopian Cetus was killed when Perseus plunged down upon it, and thrust the adamantine sword crafted by Hephaestus into its back. 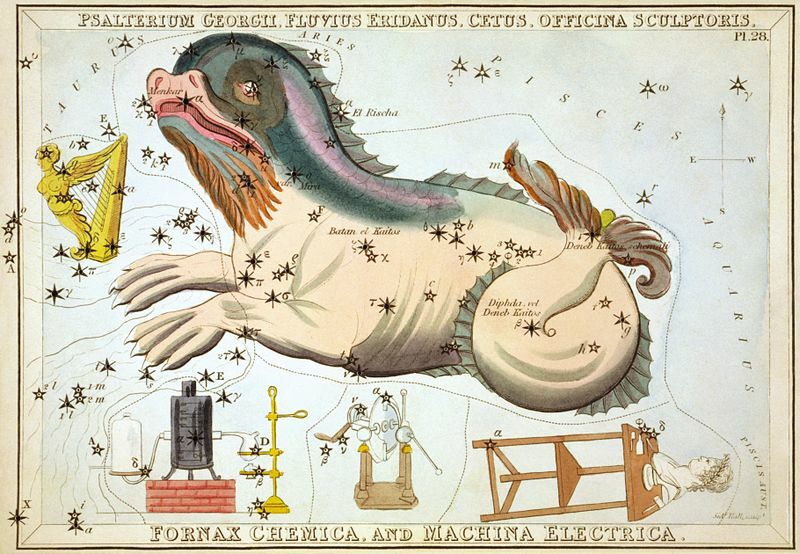 The Aethiopian Cetus’ likeness would afterwards be put amongst the stars as the constellation Cetus, alongside the other constellations of Perseus, Andromeda, Cepheus and Cassiopeia. ​The Aethiopian Cetus has become linked with the Israeli city of Jaffa, or Joppa, as it was once known, possibly through the presumption that this was the ancient city of Iope; Iope being a derivative of Iopeia or Cassiopeia. This has seen the rocks outside the harbour named as those on which Andromeda was chained, and the largest rock being the petrified Aethiopian Cetus. This though ignores the fact that Aethiopia was the land south of the Sahara in Greek mythology, and with the Aethiopian Cetus associated with the Red Sea, indicates that there was an ancient city called Iope in Aethiopia.